Burke, the most capped Women's Eagle, began playing rugby at the University of Virginia after being recruited at an activities fair on campus. After graduating, she played with D.C. Furies, Berkeley All Blues, Beantown, and Raleigh Venom. Burke made her Women’s Eagles debut in 2004 against New Zelaand and captained the national team at the IRB Women’s Rugby World Cup 2010. In 2003, Burke won the prestigious Woodley Award, given to the top collegiate player in the country. 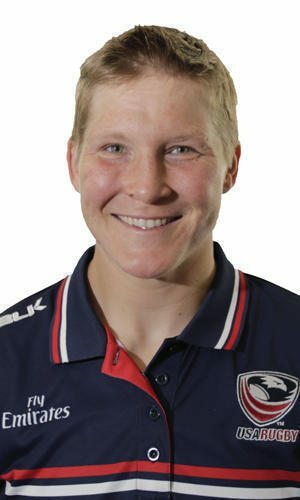 The 2014 World Cup in France marked Burke’s third appearance in the pinnacle event of women’s rugby. The prop finished her Ph.D. at the University of New Hampshire and has written many articles related to outdoor education. In 2010, Burke won the Thomas V. Moser, M.D. Memorial Scholarship, given in honor of Dr. Moser to outstanding rugby players pursuing educational goals that maximize their potential. Burke has received several other awards including IRB World Cup Dream Team, Team of the Year and Team of the Decade by Rugby Magazine, ScrumQueens All Star World Cup Team, and Team to Beat the World Champions by Letchworth. She was also named to the Team of the Year in 2011 by ScrumQueens. Jaime has started coaching since retiring from playing in 2014. She currently serves as the assistant coach for the Glendale Merlins' Women's Premier League team. She also travels for USA Rugby as a coach educator and participated in the USA WNT Coach development pathway.